THE World Rugby Council and Oceania Rugby have commenced planning to rebuild rugby union in Papua New Guinea (PNG). This was revealed in a statement issued today from Oceania Rugby following a meeting in Australia last week between a delegation of the court-appointed Interim Board of the Papua New Guinea Rugby Football Union (PNGRFU) and key personnel from World Rugby and Oceania Rugby. The meeting was a joint effort to revitalise rugby union in PNG. The statement said the delegation included Ben Frame, Michael Uiari and Syd Yates and they met World Rugby Council member and Oceania Rugby president Richard Sapias and Rugby Services Manager Oceania for World Rugby and General Manager Oceania Rugby Bruce Cook at Rugby Australia’s Headquarters in Sydney. “The meeting was an appropriate way to initiate our working relations with the Interim Board and the outcomes we achieved demonstrated our joint effort for the betterment of the game in PNG,” Sapias said in the statement. 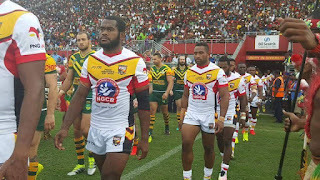 “We have commenced our planning to rebuild the game in PNG and we are moving forward with a player-centred approach in our solutions,” he said. Delegation member Uiari said the Interim Board was leaving the past behind now and had plotted a 12-month plan to take the union forward. “Key milestones have been determined and we will be working very hard to achieve these both on time and on target,” Uiari said. The statement quoted Yates, an independent member of the Interim Board, as being enthused about the way the working party was able to see a bright future for the game in PNG. He said the troubles of the past would not interfere in building a strong base for the future of the PNGRFU. “The collegiality in the group resulted in quality decision-making and these high-level outcomes will guarantee success in our efforts and work,” Yates was quoted saying. “We needed this meeting to ground us in our endeavours as a team,” delegate Frame said. He said rugby’s values came to the fore today. “I am very confident about the road we are taking now, for the future of players and the game in PNG.” Frame said. Rugby Services Manager in Oceania for World Rugby and GM Oceania Rugby Bruce Cook said the joint-meeting agreed to also implement a process to keep all key stakeholders informed of the plans and outcomes of the Interim Board as they plotted the way forward.